These are the 65 locations of the 104 commercial nuclear power reactors in the United States, showing populations living within certain distances of the plants. Population figures use the 2010 Census. 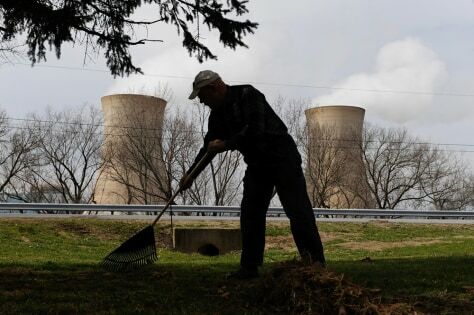 Ernie Garrison rakes his son's front yard across from the Three Mile Island nuclear power plant in Pennsylvania, where the U.S. suffered it most serious nuclear accident in 1979. The population within 10 miles of Three Mile Island grew by 10.9 percent in the past decade, while Pennsylvania's population grew only 3.4 percent. The sharp growth was typical for nuclear plants across the nation, according to Census data analyzed for msnbc.com.